Admittedly my feelings regarding this show were slightly ominous as neither musicals or slasher movies are my bag but to describe this show as either of these things would be doing it a great disservice. In fact it is hard to pinpoint exactly what it is-Grimm meets Tarantino comes closer- but any show which opens with a rabble rousing rendition of Johnny Cash’s ‘Folsom Prison Blues’ simply has to be great, the law of nature dictates it thus! Fortunately ‘The Bloody Ballad’ and the band within the show –Mary and her Missing Fingers- follow through from this more than promising beginning and provided one of the best one and a quarter hours I believe you will see on the fringe this year. Johnny Cash number aside the rest of the original material in this production was equally strong. Fronted by Mary- a flawless Lucy Rivers- the tale of a love affair between her and Connor-an equally flawless Oliver Wood- fraught with drama, tension and destined to end in tragedy as Connor’s mother Elizabeth –an extremely versatile Hannah McPake- and her family of grifters arrive on the scene. As the drama unfolds the other two performers on stage Dan Messore and Tom Cottle hold a steady back beat to proceedings but it is when all five play together that things get really raucous with their cacophonous psychobilly swamp blues, doo wop and country and western leanings; sometimes all in the same song. The dialogue was as impressive as the musical excerpts and was excellently handled by Rivers and Wood whose charisma was matched only by their chemistry. The set too was simple but effective whilst the lighting created the right mood as required showing that yet again that sometimes less is actually more. Extremely confident and comfortable with both their material and each other it was a fabulous ensemble piece that never let up for a second of its duration even in the quieter sections where the tension was still palpable. I actually loved this show and cannot recommend it highly enough even to anyone who hates musical theatre as it pushes the boundaries of this maligned genre and creates more of a live gig atmosphere. The fact it stretches itself fifteen minutes longer than the average Fringe outing is negligible as the time simply flies and total absorption into the action is irresistible. 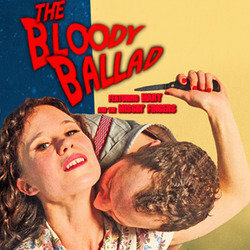 Raucous, riotous and totally debauched ‘The Bloody Ballad’ is Bloody Brilliant! A definite must see!